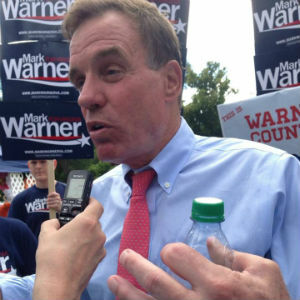 Now we can see why Mark Warner has been running from the outset like a candidate who was in a tough battle for re-election. After leading in polls in the summer by as much as 25 points, the incumbent Democratic senator is up just seven points on Republican Ed Gillespie in a new poll out Friday from Christopher Newport University. The CNU poll has Warner at 51 percent, Gillespie at 44 percent and Libertarian Robert Sarvis at 2 percent. If that trend were to hold true to Election Day next week, Sarvis would severely underperform not only where he has been throughout the 2014 polling cycle, where he had consistently been in the 5 to 7 percent range, but also where he ended up in his run in the 2013 gubernatorial race, in which Sarvis received 6.5 percent of the vote in the three-way race with Democrat Terry McAuliffe and Republican Ken Cuccinelli. The Christopher Newport poll suggests voters who had been supporting Sarvis are peeling off to break toward Gillespie, and that there has been a movement of undecideds toward Gillespie as well. An Oct. 7 CNU poll had Warner ahead of his challengers with 51 percent, Gillespie at 39 percent and Sarvis at 3 percent. Quentin Kidd, the director of the Wason Center for Public Policy at Christopher Newport, talked about the impact of negative advertising from the two major-party campaigns on the tightening of the race.